MISSION, KS--(Marketwired - Sep 30, 2015) - (Family Features) Few holidays delight kids more than Halloween. At the same time, Halloween generates significant worry in parents and with sound reason. Halloween is the deadliest day of the year for young pedestrians. According to the National Highway Traffic Safety Administration, more than twice as many children are killed in pedestrian/vehicle incidents on Halloween between 4-10 p.m. compared to the same hours on the other days of the year. Why are Halloween pedestrian fatalities so high? For more than 70 percent of kids who trick-or-treat door to door, it's due to a dangerous combination of reduced daylight, preoccupied and unaccompanied kids in the streets, and bulky costumes that often make it difficult for oncoming drivers to see them. The child safety experts at Safe Kids Worldwide urge parents to add adhesive reflective tape to Halloween costumes, but this material is expensive and often of low quality. Without sufficient time and distance to react, many drivers may see a pedestrian too late to avoid them. "Most self-adhesive reflective material on the market is not only difficult to find, it is also of the cosmetic or low-brightness variety, which is only effective at very short distances and only if used in sufficient quantities," said Chuck Gruber, CEO and founder of ReflectYourGear. "We want to make reflective material affordable and easy to use, in order to reduce preventable injuries by helping people increase their visibility to oncoming drivers. If you want to be seen in low light or darkness, our high-brightness reflective -- visible at 300 to 500 feet -- is the best option." Made with high-brightness 3M Scotchlite Reflective Material, ReflectYourGear do-it-yourself self-adhesive stickers are available for less than $10. For a limited time, visit ReflectYourGear.com and enter the code "BeSeenHalloween" to receive a free eight-piece pack of self-adhesive reflective material to ensure your young ghosts and goblins are seen and safe this Halloween. Proper placement of reflective material can also have an impact on safety. 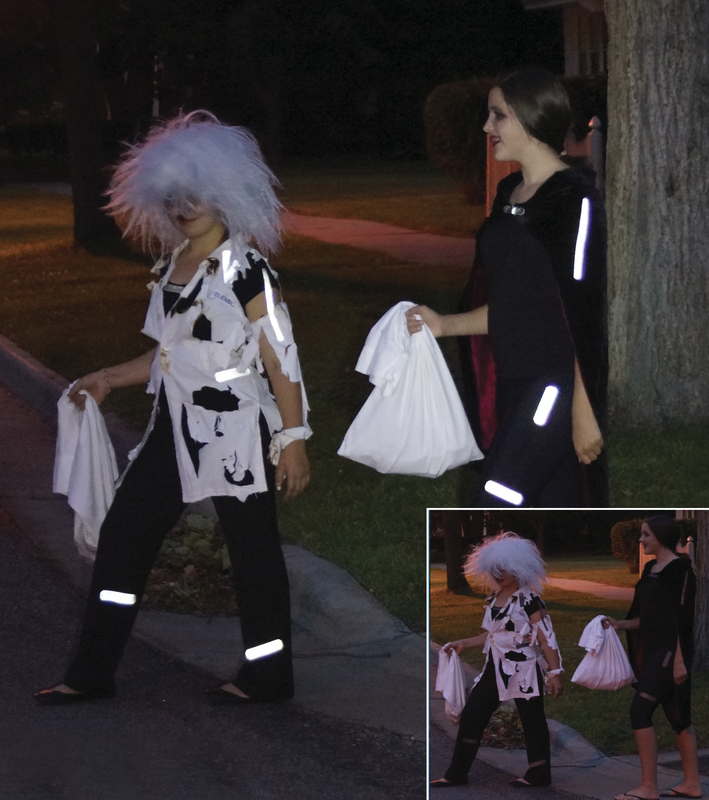 Gruber recommends 360-degree (front, back and sides, including limbs) coverage for Halloween costumes, with reflective material placed at biomotion points, such as wrists, ankles, hands, feet and shoulders. "The brain is hard-wired to distinguish human motion quickly, so when a driver sees reflective in the shape of a human, there is less time spent wondering what he's seeing and more time to react and avoid a collision," Gruber said. Parents can't remove all potential dangers from their kids' lives, but they can take steps to ensure that the only scary part about Halloween is seeing vampires. And maybe the dentist. This and other food and lifestyle content can be found at http://www.editors.familyfeatures.com. Family Features is a leading provider of free food and lifestyle content for use in print and online publications. Register with no obligation to access a variety of formatted and unformatted features, accompanying photos, and automatically updating Web content solutions.